- AnV | Art portfolio and Blog from the visual artist An Vanderlinden, who loves to work with coal. An Vanderlinden, master of visual arts, adores black. And coal as well. Since she was raised in a coal miner’s family, she has what they call “black blood in the veins”. Vanderlinden is fascinated by all shades of black and the light the coal is reflecting. 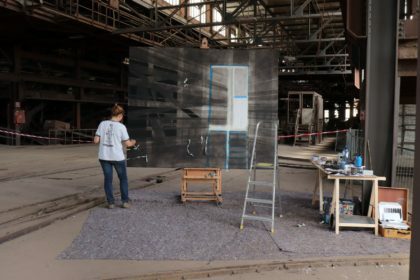 She hammers and sieves the coal in different formats and brings it in a structured way on black canvasses. That’s how she becomes different tones of light. 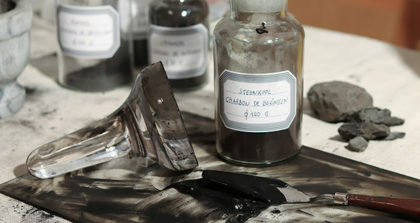 In the beginning of 2017 – in her quest for the blackest black paint- An started to triturate coal into pigment. Throughout her experiments she found out that all types of coal show another black. But the blackest of all is the coal of Beringen. She has been working on this intensively during one year before it resulted in a qualityful durable paint. 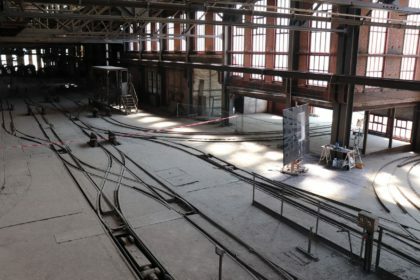 She was using this paint during 4 months in the biggest and most beautiful atelier that she could imagine: the unloading floor at the coal washery hall of Beringen. Totally overwhelmed by this venue, its environment got more and more visible in her work. First there was the chaos, the dust, and the seducing darkness of the coal washery. Then the stairs got a place in her work, just like the rails and the open doors. The light makes a whirling entry and is becoming more and more intensive, getting dazzling in her last painting.